To begin: If space is a vacuum, who changes the bag? Hmm? solid layups and curved work pressings of course. Recently, our old bag had had the bun. Full of difficult to patch holes, it was a mess. A new one though, was going to run us $550 from our original supplier. You have to pause at that expense, grimace a bit and patch a few more times. Then, frustrated and cruising the net one day I ran across veneer supplies.com. Besides providing an amazing array of veneers and supplies, they also offered a Build A Bag system for a reasonable cost. What it was consisted of a seamless tube of 20 mil polyurethane plus the bag closures and a flush mount valve stem. A 5’ x 12’ bag for us ran only $185. Hell, let’s get two. Much smaller ones are available for the home shop. One and a half days after ordering we got it shipped from Maryland across the border to Toronto! That’s fast. E-mails to the site were helpful and returned promptly. Read their about us to have a good idea of the fine US company here. We ordered additional fittings to have dual air flow from our HI-Flow pump and were very pleased with the quality of these pieces. Solid brass and accurately machined. The stretch factor compared to our old vinyl bag was outstanding. No more un-pressurized ridges on top (so important with veneer) and it also being a glue releasing surface. Because it was so clean and new we had to put in a chain to the corner of the work most times because the bag would self seal around it and provide no pressure. That’ll change as it gets dirty. If you’re new to this clamping method, they also provide low cost venturi or oil-less pumps to make up a complete system. For a bag replacement or entry into the world of vacuum pressing I heartily recommend this company and their products. It’s all good now, yet it seems that some guys in the shop are still not perfectly clear on the concept. Don’t remind me of the lovely bits of sawdust on the lens. Phff. y r the tools vacd to the bench? M, I’ll press those flowers for you if send them over. 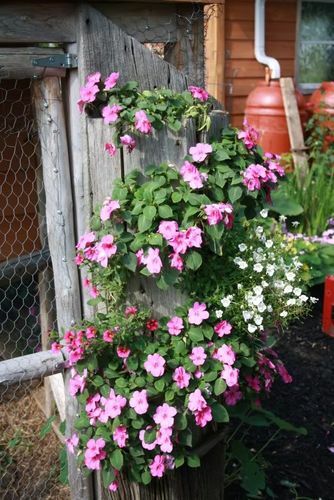 Put them on mdf and you’ll look pretty in pink. Space is like a Dyson, it’s bagless. Silly boy. I have my bag and flat press made out of this. Good stuff. Much smaller than yours. Good people to work with. Nice tip with the small chain, I have been using small strips of plastic mesh and they always slide around. It looks like the chain would stay in place. Thanks for the review, i will keep this company in mind for future. Nice to see that you can get a decent bag and accessories for a much lower price now. 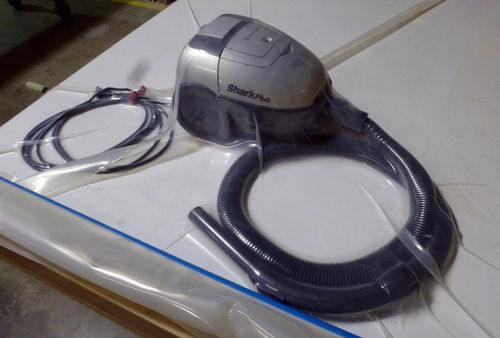 I will probably never need one, but I have an old carpentry book from the early 70’s where a vacuum bag setup is just a black plastic trash bag and vacuum cleaner was used to pull out the air. I have always wondered how that worked. I made the venturi style years ago from their free online plans and my own bags from the heavy vinyl that soft boat tops’ windows are made from, edges glued with vinyl pool repair glue. It has worked really well for me on many projects. My large bag is about 4’ x8’. Whole system was around $250 as I remember, not counting the compressor of course. Good company to deal with . I’ve found that my local fabric store sells a 10mil vinyl super-cheap. I also use double sided foam tape from HD that seals the edges fast and leak free. They won’t be as durable as 20 mil or 30 mil bags, but for that one time use goofy setup they are perfect. Great tips on how to make up a new bag. Thanks! 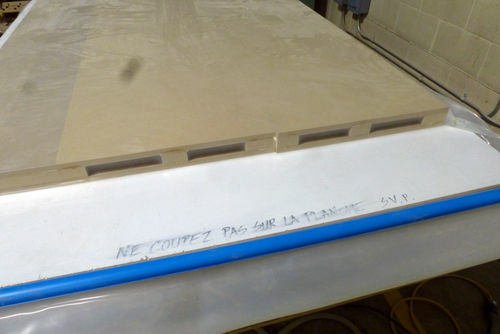 Just curious – why no grooves in your platen? Grooves would make the chain (or plastic mesh) unnecessary. I use grooves in the base, really squares going both directions and my hose goes into the side of the melamine and up into the groove. So all of the vacuum is being pulled through the slots. I’ve bought a lot of stuff from Joe. I built my vacuum pump from parts and plans from this company. It was very reasonable and the directions were very clear. My first Bag was made from heavy vinyl I bought at Jo Ann Fabrics, I made a 4’x 10 bag for under 40 bucks with the glue veneer supplies .com sells. I still use that bag but just recently bought a 2’x4’ bag from them for smaller projects and I can really tell what a quality bag is like now. Great review! I had a pump, but bought the hardware kit and made the PVC reservour with the plans. Good company to do business with. Nice to see everyone sharing their experience. More is good. Thanks a lot. Our system and procedure, to answer a couple of questions, is like Karson’s. 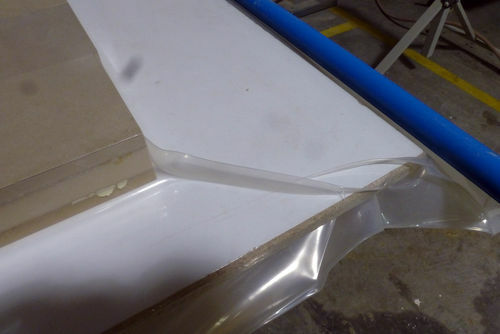 There is an dead on 8” torsion box underneath, holding two sheets of melamine inside the bag. The top one slides out to take the work. The bottom sheet is square grooved underneath right up to the two valves. Grooves on the top surface (or even heavy knife cuts for that matter) can give very low pressure resulting in pressed ridges on veneer. Air is escaping everywhere yet the new plastic is like Saran Wrap now and so we need a chain to allow air flow to the piece no matter what. Still, what a delight to use a good vac bag. Gene: It might be the groves that are giving me problems. For my home use I’ve found it easier to only veneer one side at a time, So I’ll have a caul on the one side and then after a couple of hours I’ll do the other side if it’s required. I’ve also found it easier to use a large caul put it on the bottom and then place my veneer on the veneer side down. That way I don’t need to cut a bunch of cauls to match my piece. I never get an caul bending over the edges and giving low pressure toward the edge of the panel. This way the panel itself is the top cau and the bottom caul is pressed against the veneer. 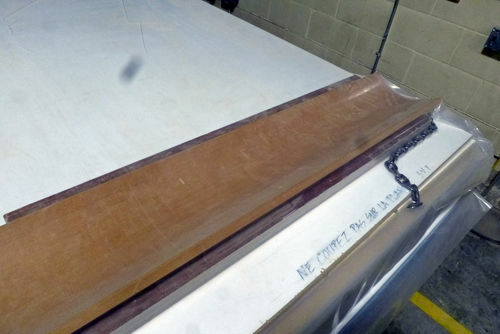 The veneer source that you referenced also sales a top sheet of what looks like plastic fencing. I put that on top of my panels (It doesn’t work well on the veneered side even though he advertises it that way.) That’s what I use to give an air passage to edge of the bag. .... Er, .. Ah .. there’s always hammer veneering. The rest of us will likely use what we know and are set up to use. Hammer veneering is intriguing to me, but, I’d probably need a tutor to get started and also not be working on a time critical project for a client when I do it.